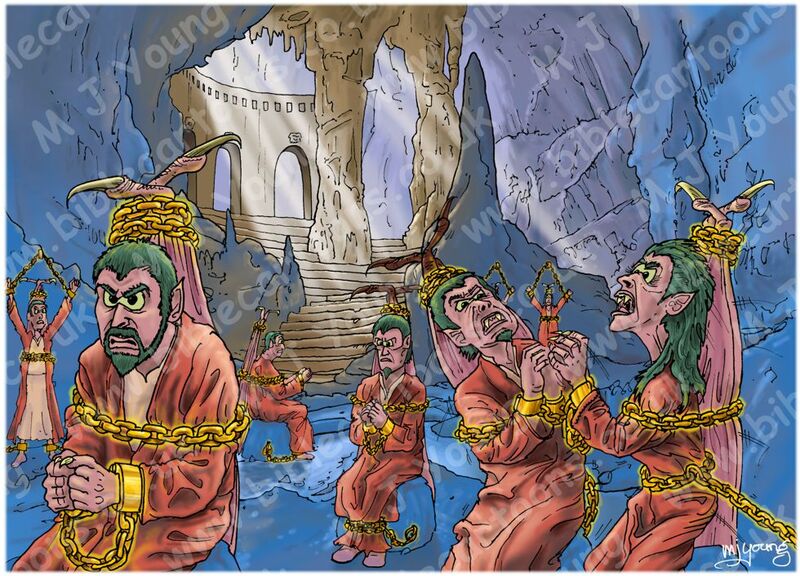 Bible Cartoons: Jude goes green - with fallen angels in prison! This version is a little harder to make out, as both the background (cool blues) & fallen angels (greens) are similar in colour contrast. I was keen to draw fallen angels in that green colour though! This version has a naturally higher colour contrast, since the background is cool blues, whilst the fallen angels are warm reds. 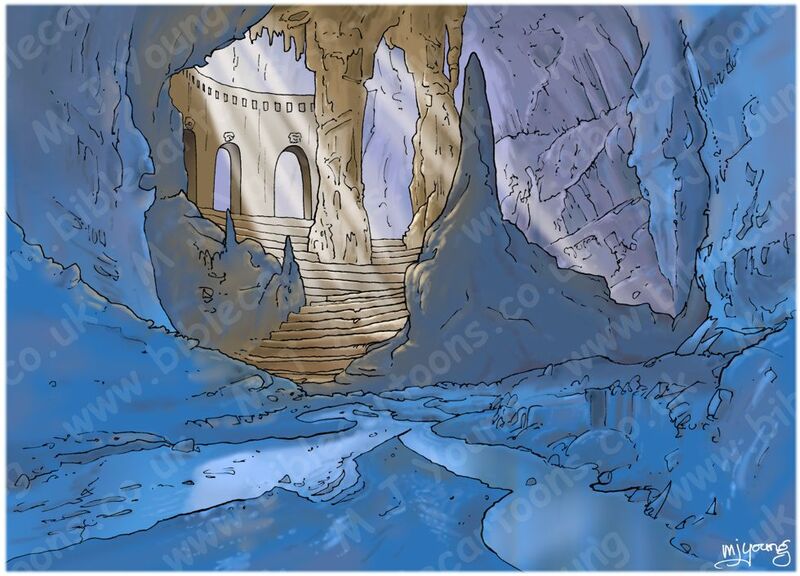 The high contrast between the warm reds & cool blues thus makes it easier to see the various elements in the scene. You can see 8 fallen angels depicted in my scene (one is almost obscured by the squabbling pair in the foreground! 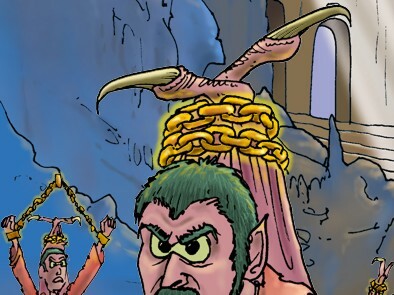 ), though there are probably a lot more than that in God’s specially designed dungeon! 3 are chained standing against walls, the remainder are chained, sitting on rocks. 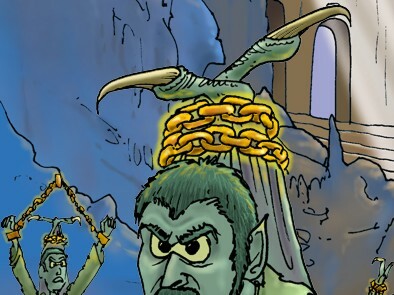 Close-up of chain bound green fallen angel wings. Close-up of chain bound red fallen angel wings. 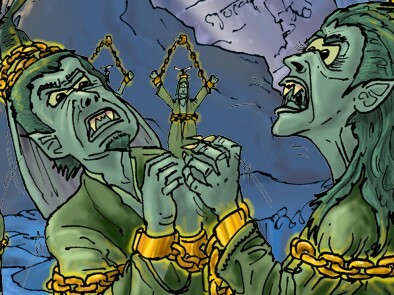 Close-up of 2 green squabbling fallen angels. Close-up of 2 red squabbling fallen angels. 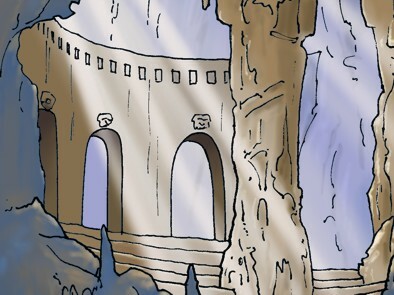 Background landscape, without the fallen angel figures. Close-up of stone lion’s heads in prison entrance & light beams.